Perched between the jagged peaks of the Julian Alps and the Soča Valley, a small settlement of about a thousand carries not only a long history but also incredible landscapes. 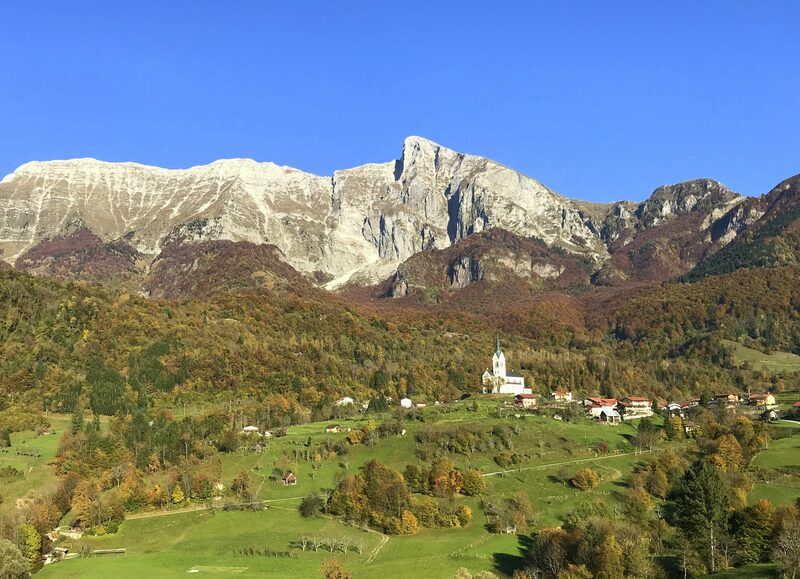 While Kobarid’s intriguing part of the history, the 1917 Battle of Caporetto, made it actually world renowned with Ernest Hemingway’s A Farewell to Arms, experiencing it in person completely surpasses one’s expectations. It offers a whole pack of outdoor activities, anything from kayaking in the white waters, relaxing on long dusty bike trails, sport climbing, paragliding, to exploring endless trails over small hills and rocky faces of high mountains. I visited Kobarid with my family a month ago, when birds were still singing and the temperatures rose to a pleasant 20 degrees C during the day. 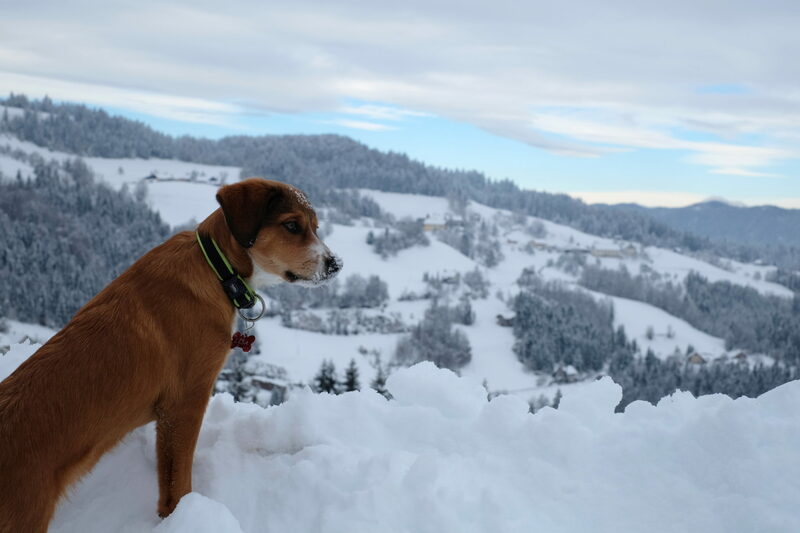 While I’m sure it’s even more beautiful under a white blanket of fluffy snow, please take notice that the mountaineering conditions now might not be as favorable as a month ago. More on hiking safety. 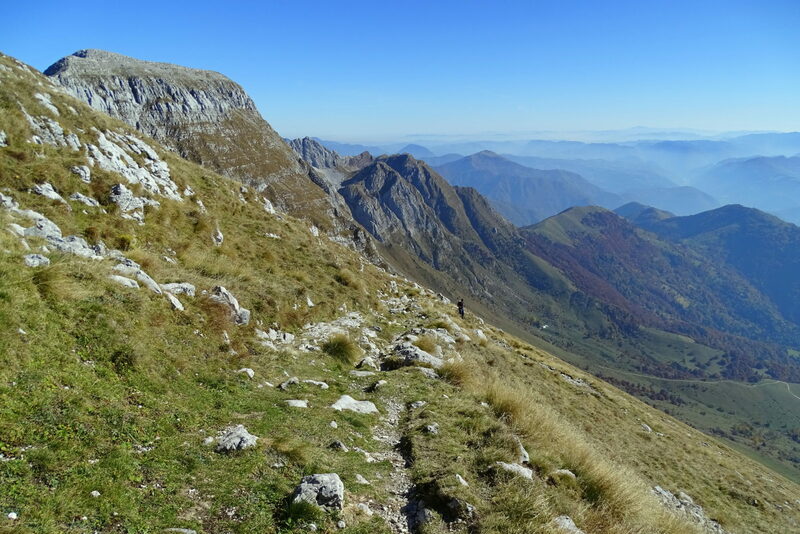 Now, here are two ideas for mountaineering close to Kobarid; one perfect for family hiking, and another far more challenging yet incredibly satisfying. If the locals call it “Stu” or just Stol, the general public knows it as Kobariški Stol or the Stol (in Eng. 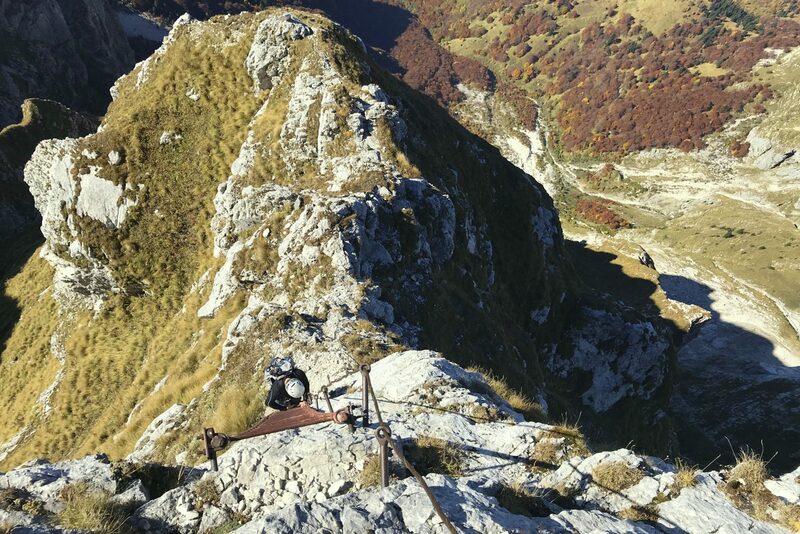 Chair) rising above Kobarid. 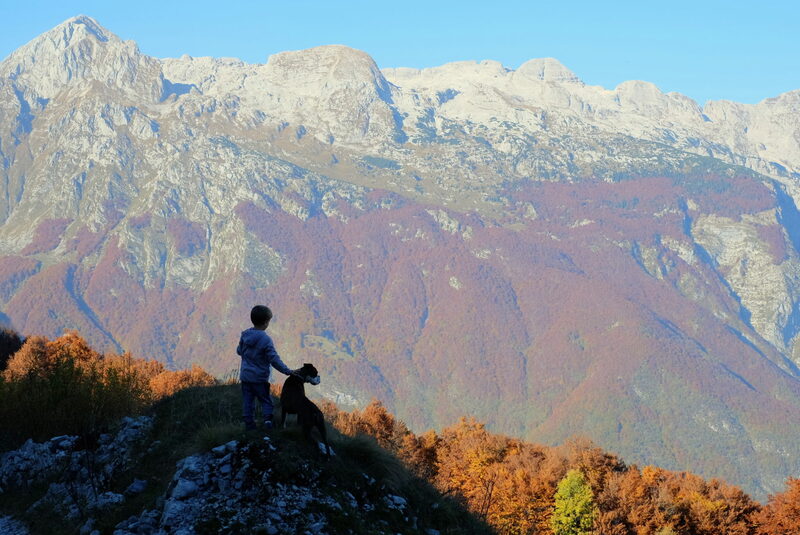 Stol is actually the highest peak of the eastern part of the Stol Massif, the longest massif of the Julian Alps that stretches 34 km between Kobarid and Italian’s Humin. 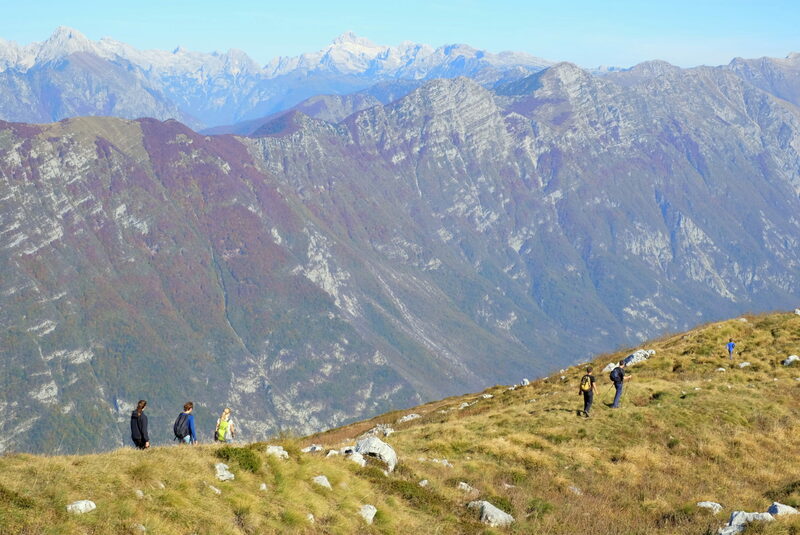 Walking along the ridge is unbelievably scenic as it affords stellar views of other mountains like Krn, Kanin, Triglav, and even the Adriatic Sea, while the trail is easy and sunny. You want incredible photos for your family album? Then go to Kobariški Stol. Seriously. 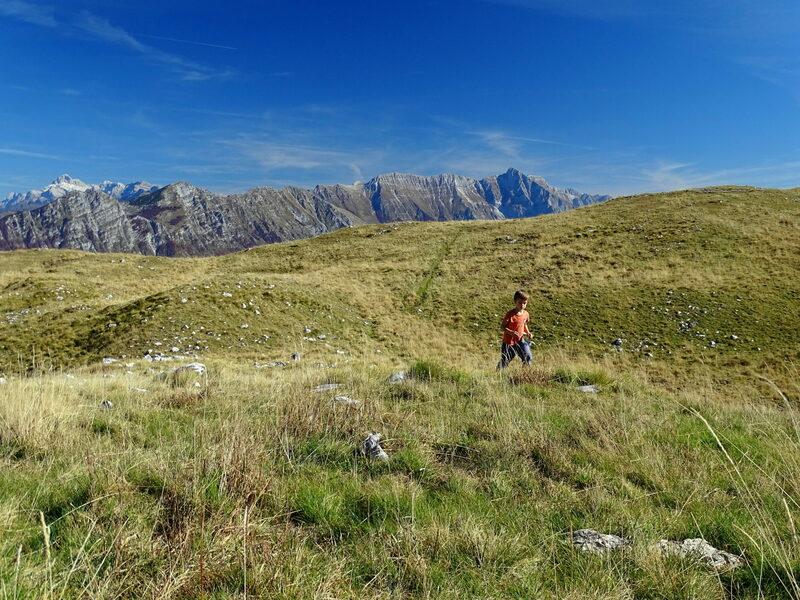 The last few kilometers follow a long ridge line which lets you soak up spectacular views. When your kid stops in the setting sun to observe the grand mountains in front, you know the trip was a success. Kobariški Stol is also favored by paragliders and downhill riders. 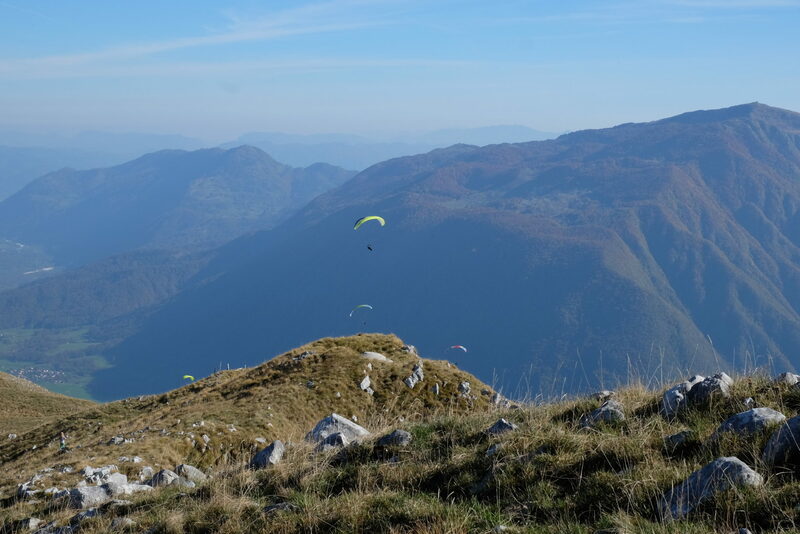 If we hiked up as a family, my 20-years-old nephew Lovro brought along his paraglider and jumped from just beneath the top of Kobariški Stol towards Kobarid. 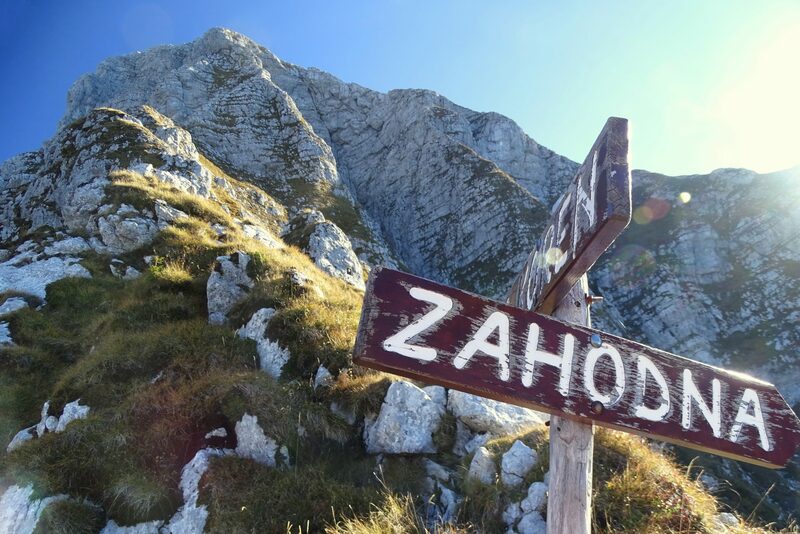 Although you could start your hike directly in the center of Kobarid, I suggest you cut the otherwise 4-hour and 1,500-meter (ascent) long trail and drive for about 20 minutes towards the old border passing Učja and then follow a forest road up the mountain as far as you and your car still feel comfortable. Don’t worry, it’s a nice enough wide road but not in perfect condition. If you manage to drive to the very end of the road, the trail from there to the top is marked for one hour. We arrived there in two cars, parked them by the side of the road and then hit the 9-km and 918-m (ascent) easily sloping trail to the top. With kids, that lasted for about 3.5 hours, the countless stops for snacks included, so I imagine a normally fit person could easily halve the time to about 1.5-2 hours for the way up. Nevertheless, we finished the whole trip in a little over 6 hours, a bit tired from having walked 18 km. On a sunny day like ours the views can be epic. 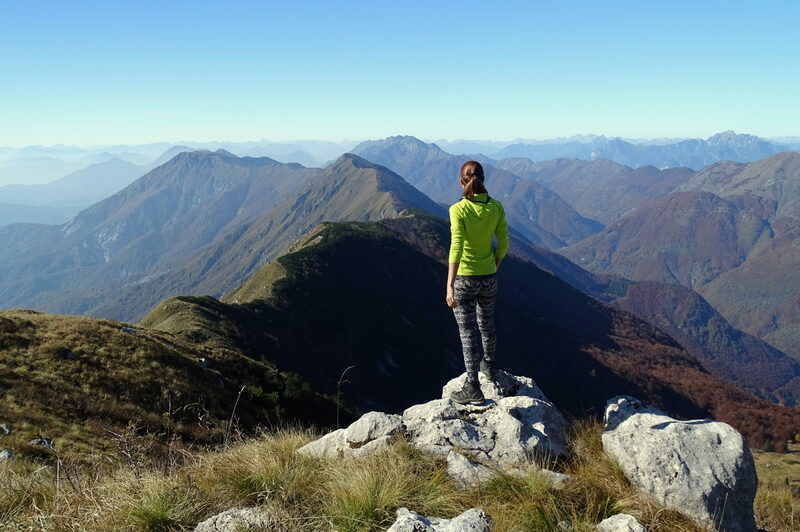 The whole ridge section is a real feast for the eyes – Kobarid and the valley on one side, some of the highest peaks of the Julian Alps on the other, while the ridge extends as far as the eye can see and sinks somewhere behind a seventh peak. 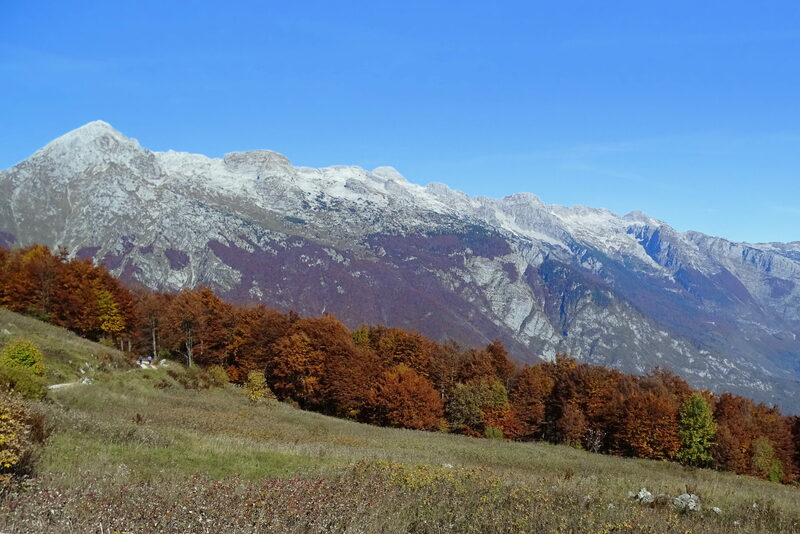 As I’m sure you’ll want to extend your hike further along the ridge (I know I would if I was walking without the kids) your next peak could be Muzec, 1,612 m, and then Breški Jalovec passing onto the Italian side of the Stol Massif. 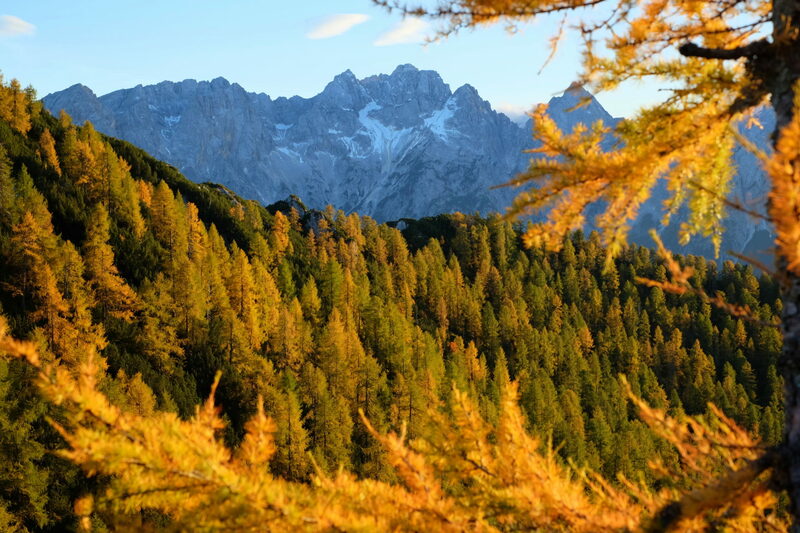 The next peak along the ridge is Muzec, 1,612 m, and then Breški Jalovec, 1,613 m, across the Italian side of the longest massif in the Julian Alps. 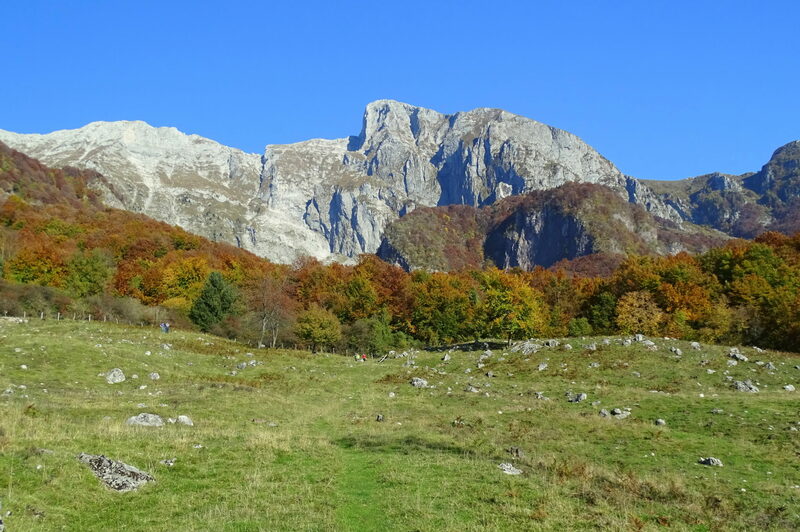 Autumn hiking from Učja Pass to Kobariški Stol. Marked as highly demanding, the Silvo Koren Route is by far the most challenging route I’ve done over the past years. It ascends 1,691 m up the majestic western wall of Mt. 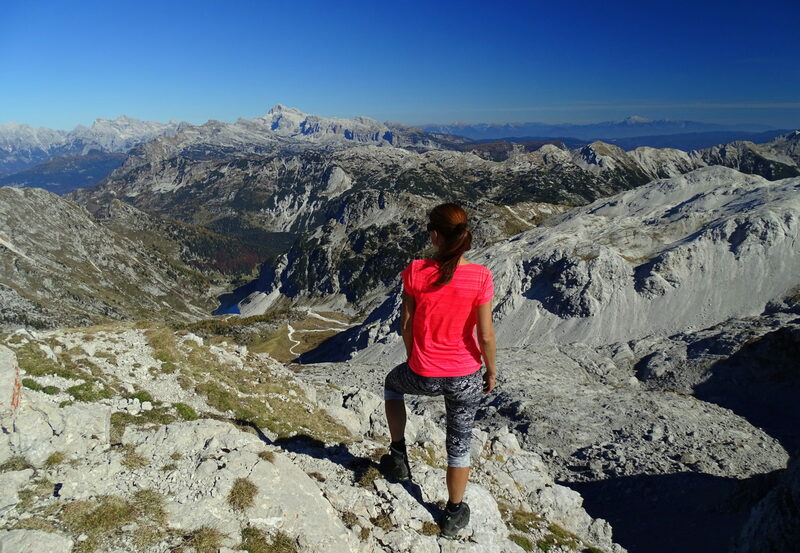 Krn, 2,244 m, the highest mountain of the Krn Mountains in the southwestern Julian Alps. It’s not a route for beginners, but if you’re into adventures full of adrenaline and have done some mountaineering in the past, I say go for it! Mt. Krn and its majestic western wall soaring up from the enchanting Drežnica Village. The route starts from a small Alpine village of Drežnica above the Soča River, with the famous Kozjak Waterfall just a few kilometers down the road. It first passes beautiful meadows and forests, but right after it hits the tree line, that’s where the real climbing begins. Slowly at first, with a steel cable allowing you to clip, but then gradually you gain exposure as well as adrenaline. 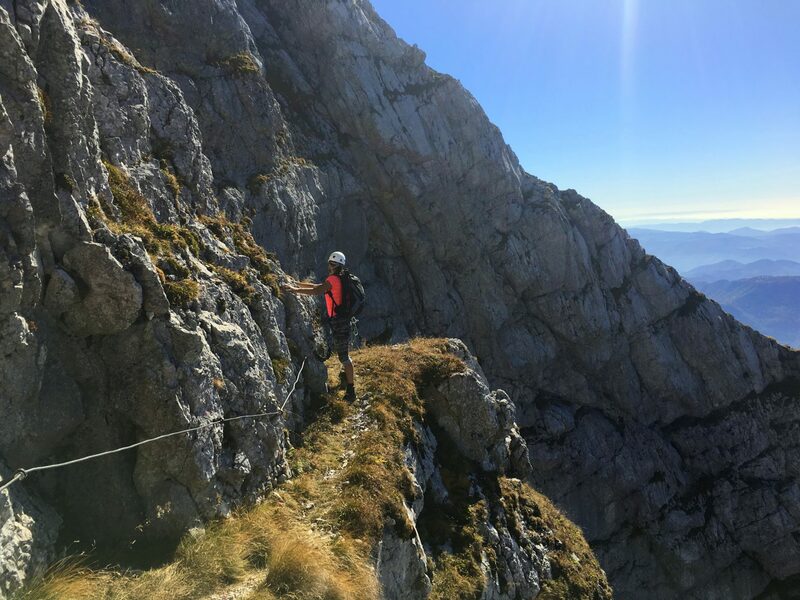 Expect to find the most steep and exposed sections mainly over rocky terrain secured by steel cables, which you can easily attach yourself to with a via ferrata set. Nevertheless, the rest of the route requires free climbing mostly over very steep grassy slopes, and that’s where it gets the most adventurous. There’s no backup nor a place for mindless errors; it’s rather a serious playground for those who love the challenge. It’s really a route that requires one-hundred-percent focus throughout the climb (2 hours approach, 2-3 hours climbing), yet offers so much in return. Signs on the way can be a bit confusing. What I learned a month ago is to simply follow red-white paint blazes that start in Drežnica, then follow the signs for the West Route (Zahodna Route) until about two thirds along the climb when the Silvo Koren Route finally separates from the Zahodna Route. The first section is more or less shady. For better safety and mental comfort, don’t tackle the Silvo Koren Route without a helmet, a climbing harness and a via ferrata set. The route climbs over the near vertical west face of Mt. Krn and, therefore, requires to climb over two ladders. 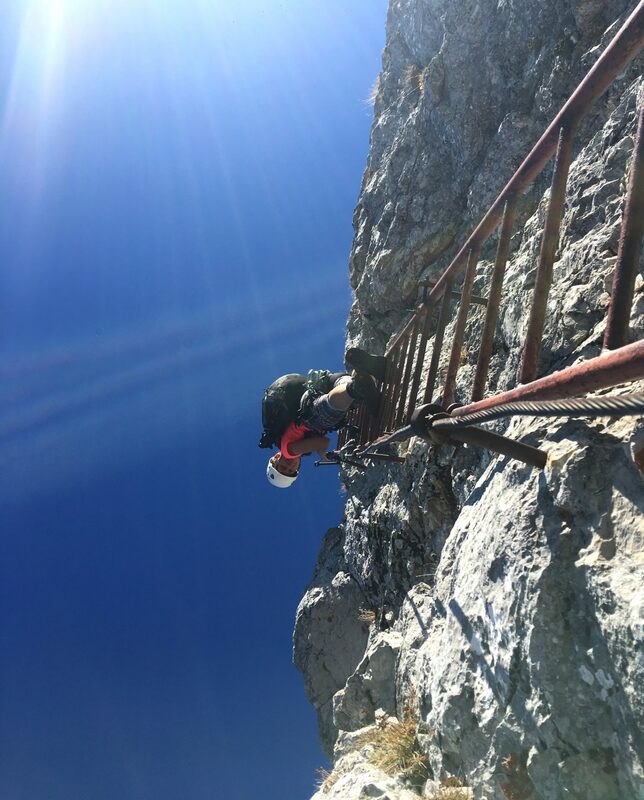 In case you’re wondering, no, this ladder isn’t the most exposed part of the climb. 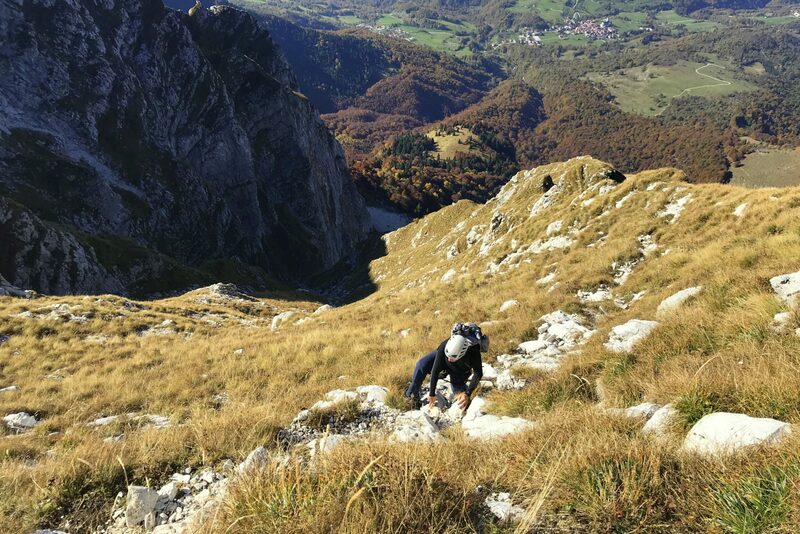 It’s the steep grassy slopes that are the most adventurous since there’s no option to attach your via ferrata set onto. I imagine these steep grassy slopes get super slippery with the first frost and as such call for an early use of winter gear. More on hiking safety. Beyond pride and thrilled, soaking up the beautiful panorama from the top of Mt. Krn, 2,244. Here’s an interesting fact: my husband and I were two of just eight people who conquered the Silvo Koren Route that day! Returning back to Drežnica down the South Route. The South Route from Drežnica to Krn is marked as easy but long (5 hours). 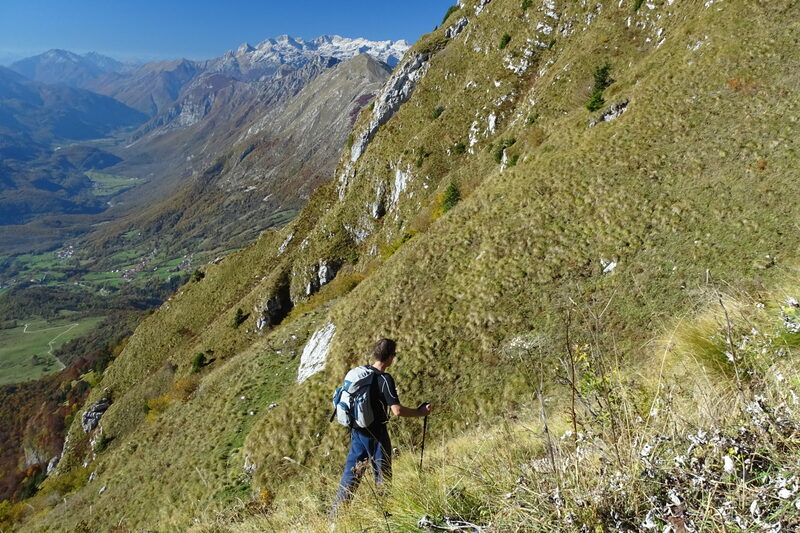 With the warm October sun and only half a liter of water in our backpack, the descent seemed unbearably long and hot. Imagine our relief when we reached a water spring in the last section of the descent. We climbed up that monster wall, yaaay! The must-know before you head off to Mt. 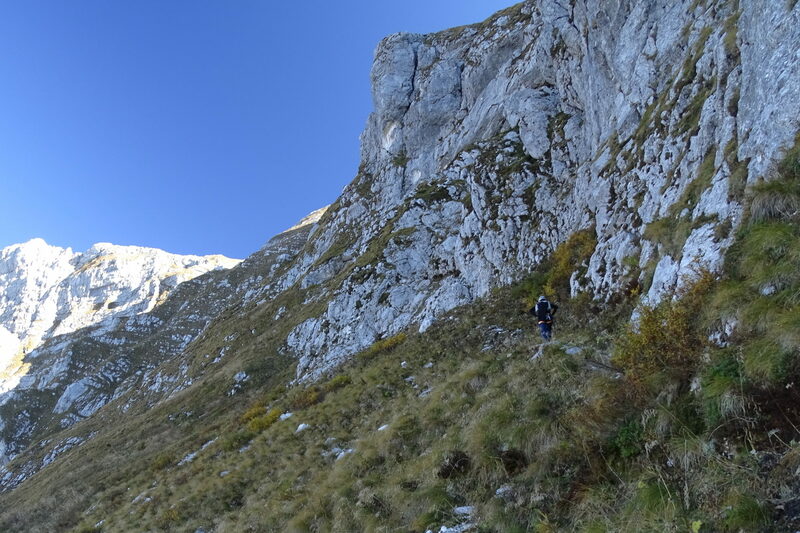 Krn via the Silvo Koren Route: it’s highly recommended to climb it with complete via ferrata gear (a helmet, a harness, a via ferrata set), while crampons and an ice axe are an obvious choice as soon as early winter conditions with only patches of snow here and there. Plus, bring lots of water as the route is on the sunny side and no mountain hut is open right now (the last water is at the Na Črniku Bivouac about two hours from the trailhead). Whether you decide to do both trips or just one (or none? ), I encourage you all to explore the lesser known parts of Slovenia. The drive might push you a touch away from your comfort zone, but you might be surprised to find an adventure of your lifetime. Stay tuned for more outdoor adventures! Follow me on Facebook, Twitter, Instagram, Youtube and subscribe to the feed. For rooms, apartments and holiday houses in Slovenia, you might want to check ViaSlovenia and Apartmaji brez posrednika as they are both super competitive!